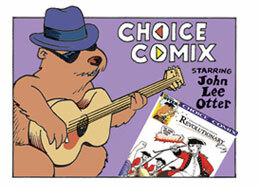 Chester Comix - Comic books and graphic novels that bring history to life! Comic books that bring history to life! How do I draw Chester? "My 8 year old son is eating these comics up!!! We bought the full set about a month or so ago, and he has already read through half of them!!!!" I have some awesome shelved projects. That rough draft for a whole comic about Ancient India got approval from every educator I showed it to – right up to college professors who study that culture saturated with history and myth. I planned to pay for this book myself because I would sell a LOT of copies to a giant Virginia school district that mandated the teaching of Ancient India. But the draft made district officials too nervous, I lost the main customer, and I never touched the draft again. Once a museum director asked me to make a pitch for a comic book biography of General George Marshall. 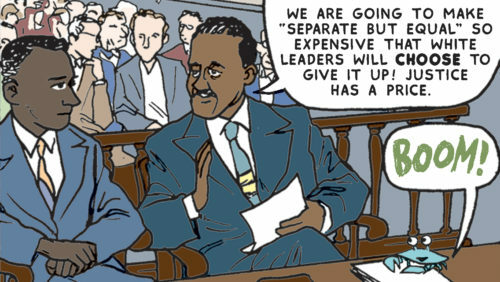 It would have been hard to draw a whole book about Marshall, since his genius was in PLANNING (lots of drawings of MEETINGS!! }, but I was willing to try because he was a major force in the World War II era. The money people wouldn’t pay for even a draft to test this idea. I voluntarily drew and colored two pages to demonstrate a comic version of a high school textbook about the core debates that have echoed through our politics for more than two centuries. I was excited to use color flow to show how two basic viewpoints on an issue (big vs. small government!} collided in a historical era. Those two pages came out beautifully. The textbook maker decided NAAAAAAH. A lot of good ideas get stuck on the chit-chat side of the money contract. One woman’s vision to have me tell the history of her cute little Virginia town never got to the money stage. There are countless party conversations where someone gets a light bulb about matching my art to their favorite history, and then no one ever follows up. Sometimes we get past the contract phase. Last year a major retelling of the Lewis and Clark expedition from the viewpoint of the Native American nations fell apart because the ambitious rough draft showed what the Native Americans thought — too dangerous. The buyers bailed. When the Lewis and Clark project vanished, I got a clear view of my landscape of half-finished ideas. And there was Abe. I rough drafted a whole book about Abraham Lincoln a decade ago, hoping to get some sales off of the bicentennial celebration of his birth. I . . . uhhhhh. . . missed that window. Other projects came along with checks attached to them, and I took those to pay the mortgage. Doing a book purely for myself, paid for by only me, is a great risk. Of course, Abe is worth the risk. But I also couldn’t begin on the final drawings for the Abe book until I confronted the truth: I let Abe sit on the shelf so long because I am intimidated by him. I’ve always loved Abe Lincoln, and he’s a towering figure who is hard to sum up in one comic. HUNDREDS of books have been written about him. And my dad loved Lincoln, too. He made sculptures and paintings of Abe for me. Returning to Abe this year would mean I would have to go back into the tunnel where I left the Abe draft years ago and carry it forward in the chill air left after my dad’s passing in 2015. Could I finally get Abe all the way through, out into the light? Could I stay focused for three months, or would I nibble awhile and then leave him behind in the dark again? I hope you like new book. Posted in Author's Purpose, Civil War, Comix Creation | Comments Off on Zombie Abe Lincoln! I started getting the messages a year ago from enthusiastic moms who already knew my books: I should do a comic about Alexander Hamilton!! I happily agreed. And then I resisted. Some of it was carefulness that has soaked into me during 14 years of running this business. It takes a lot to keep 30 titles in print and moving smoothly out the door. Adding another title takes an investment of months to research, write, draw and color it. Once printed, its weight is added to the inventory: another item to track, another item to manage — and if it doesn’t sell, it’s an even bigger drag on the operation. My art has to be both fun AND a good investment. But most of my resistance was just professional jealousy. Someone else had already found a way to make A CARGO SHIP FULL OF MONEY on a fun, lively biography of a Founding Father. There seemed to be no room for my slice of pop culture when the Hamilton musical was burning up the available oxygen. “Don’t give in to the hate,” I heard Oben-wan Franklin tell me. Right you are, Old Ben — and the easiest way to avoid the artistic hate was to just ignore It. You know, ignore that thing selling a 2 hour and 20 minute soundtrack about the Constitution like it was “Saturday Night Fever.” IG. NORE. I will soon, I said. She had just solved my business problem. Now I had to finally confront my artistic problem. HOW could I tell Alexander Hamilton’s story in my own way, separate from the style and feel of the musical now on infinite loop in millions of family vehicles carrying teen-aged daughters and their moms? The musical has great metaphors and wordplay to it – Hamilton is “writing like he’s running out of time.” But they’re not very visual once you get past the duel. The duel is great for a dramatic play, but Hamilton is MUCH more than that duel. How could I make that point with a metaphor that’s visual but still fun? The answer was as close to me as my own sons and my nephews living nearby. We are GAMERS. Games teach strategy and social skills and math and language. I didn’t think it would be possible to orient family life around games more than I had in raising my sons, but now I am astounded at how much the families in my nephews’ community play board games and strategy games together. There are literally bars in Columbus set up so you can have a beer while you play Parcheesi or Settlers of Catan. So that’s the metaphor of my Hamilton biography. The fun of a game begins with a fair start. In chess, both players start with the same pieces. In Monopoly, players don’t bring their own wallet to the table, they get the same set amount of play money. How exciting it must have been for teen-aged Alexander Hamilton to come to New York City as an immigrant and feel that here in this port of many people he had an equal chance to succeed. In the bustle of the city, his energy and intelligence could bring him success alongside the children of wealthy, established American families. Then, when it came time to create a new nation with a new set of rules, Hamilton fought to make sure those rules gave people the equal opportunity that he had as a young man in America. What else is government except a set of rules that we all agree to play by? I actually love hacking my old cartoons to pieces. 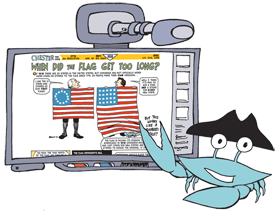 I’ve been doing that a lot in the past three years, to transition Chester the Crab’s adventures from the printed page to mobile digital devices. Chester’s library of digital stories is now available for Android devices and for the Kindle Fire. Don’t panic — I plan to keep at least 30 titles in print even as I dig hard to put more of his adventures onto the screens where today’s students are reading. Adding Chester’s stories to smartphones and tablets just makes good business sense. The revelation here is how interesting the transition process is to me as an artist/writer/educator/historian. My dad was an Artist, capital A. He had gallery shows and sold his original pieces. A painter or sculptor doesn’t have an editor beyond their own personal sense of mission. Having an editor is the exact OPPOSITE of the freedom an Artist needs to pursue self-expression and challenging themes. But I am not an Artist. My art is very functional and directed — it has a purpose that is fitted to my writing and my educating, like parts of a rocket that must work together to get the rocket to a specific place. I need editors to get the rocket there in the best way possible. I trained to be a journalist, so for decades I have practiced and welcomed the dynamic between an editor and a creator. If you think your art can be edited, that means it can be changed for the better. 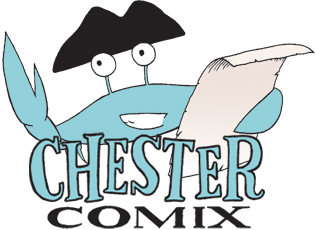 I am terribly proud of the work I did for the Daily Press in Virginia when I created Chester in 1995 and then produced daily educational comix from 1999 to 2004. But it was also a mad dash through a burning forest to get all those stories researched, written, rough drafted, edited, drawn, colored and edited again. Fellow cartoonists couldn’t believe my workload to get the stories into print on a newspaper schedule. Looking back now, 15 years later, some of those stories hold up really well. Some DON’T!!! Some of the art is painful for me to look at. And I’ve learned a lot more about many of these historical topics in the time since I drew for the Daily Press. So instead of it being painful to take these big pages of cartoons and hack them down into little horizontal panels for little screens, this editing work to put Chester’s old stories onto mobile devices actually feels like FREEDOM, in my own framework of making art. This transition work completely challenges my storytelling skills and makes me rethink the point of each panel. The rethinking is so revolutionary that they feel like completely new stories. Woody Guthrie kept reworking “This Land is Your Land” throughout his life, so if Woody can do it, I can do it. Some of the changes will be unnoticeable to most readers: I have literally found commas that were backwards! Other changes may be noticeable to the sharp-eyed fans: as a writer, I’ve enjoyed trimming a word here and a word there to make the comix storytelling smoother and tighter and more expressive; when I trim a word or two, I often redraw the word bubble so the spacing is balanced again; that leads to a little bit more image in the panel. I can feel the art breathing better. Comix is like alchemy — there is a magic to getting just the right balance of words and pictures in each panel and across a whole page. Some of my old pages for the newspaper version of Chester were WAY OFF that balance as I rushed to cram educational information in. A lot of the changes will be wildly obvious to longtime Chester readers — these apps have stories with entirely new panels!! But just as significant has been the turn of the images from vertical to horizontal. My space in the newspaper was vertical, so my storytelling was oriented that way. Now I’m recutting panels so that the stories are always read by holding the phone or tablet sideways. That seems to fit the flow of historical storytelling better — racing across the timeline as you swipe from panel to panel easily. Plus, Chester is wider than he is tall, anyway. If you still want to see Chester’s adventures in the exact way they were first drawn, you can buy them as iBooks for an iPad. And when we get to holograms, I’ll figure out how to tell the stories there, too.